Figure 1: A theoretically ideal histogram for suspension velocities, showing a bell-shaped distribution of velocity over time. Positive values represent compression, while negative values represent rebound. One very useful technique for suspension setup is to use histograms and suspension velocity analysis to evaluate spring and damping settings. Histograms put values to how much time the suspension is active in each damping range (high-speed and low-speed compression and rebound damping), and by using some basic statistical analysis techniques, that information can be used to make spring and/or damping adjustments to the motorcycle and improve its performance. Histograms, as we have discussed previously, are a way to display data in terms of distribution. 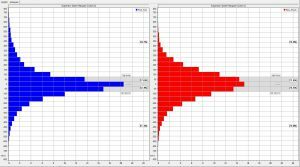 The histogram splits the data into segments covering a range, and displays how many or what percentage of the data points fall into each range. For example, a histogram can be used to divide the engine’s rev range into 1000 rpm increments, and show that the engine spends 20 percent of its time between 14,000 and 15,000 rpm during a lap. Or a histogram of throttle position can be used to show that the throttle is fully opened for 35 percent of the time over a lap. In terms of suspension, here we are concerned with vertical wheel velocity, and how that data is spread over the range of wheel velocities based on time. Much of the material covered here is derived from Jorge Segers’ book, Analysis Techniques for Racecar Data Acquisition. This book is an excellent reference for suspension analysis, although it covers cars rather than motorcycles; practice shows that this distinction is significant, especially when it comes to histogram analysis. 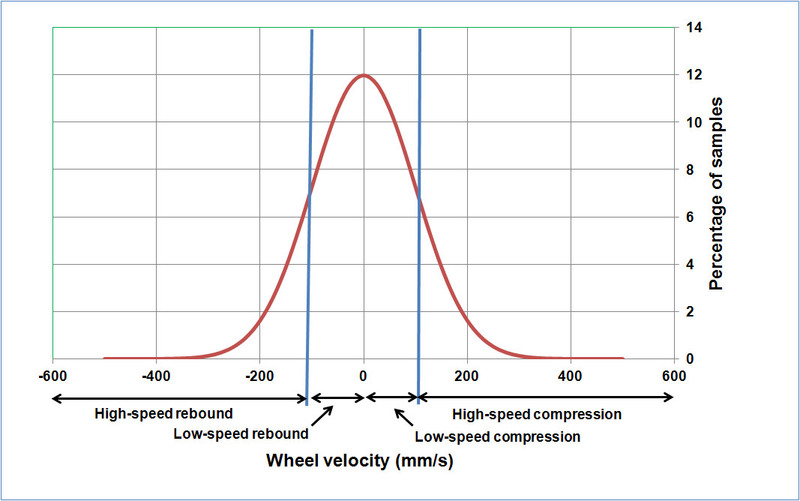 Wheel velocities can be found by taking the derivative of the wheel position data, and because we are interested in very high wheel velocities (to evaluate high-speed damping), suspension position data must be sampled at a high rate – typically a minimum of 200 hz, and preferably at 500 hz. An “ideal” histogram of suspension velocity data is shown in figure 1. Here the chart shows wheel velocity on the x axis, and the percentage of samples (in effect the amount of time spent) in each range. Positive velocity values denote compression of the suspension, while negative values are used for rebound. This histogram has an ideal bell-shaped curve, with an equal amount of samples in compression and rebound and more samples in the low-speed segments than the high-speed segments. Note that the values sum to 100 percent. In a theoretically ideal setup, the high-speed compression and rebound numbers are identical, and the low-speed compression and rebound numbers are identical. In addition, ideally the front fork and rear shock histograms would be identical, with the same numbers in each zone. Figure 2 shows some sample data from AiM’s Race Studio 2 analysis package. The software automatically analyzes suspension position data and outputs the histogram and summary percentages. Figure 2. AiM’s suspension analysis in its Race Studio 2 software package automatically generates suspension velocity histograms from position data. In working with the histograms, we must set a transition point between low-speed and high-speed damping. In both examples here they are set at 100mm/s of wheel velocity; this value is not cast in stone, however. In the car world, suspension velocities are well-defined as far as where the high-speed/low-speed transition occurs. But for motorcycles, the transition is not at one set point but rather over a range. So, for example, a low-speed damping adjustment could affect the histogram (and suspension action) at more than 100mm/s, but a high-speed adjustment could affect performance at velocities well below 100mm/s. 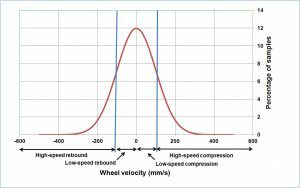 Another difference between bikes and cars are the maximum wheel velocities obtained. In the automotive world, velocities of more than 200mm/s are seen only as the car goes over curbs, but for motorcycle data we often see values greater than 800 or even 1000mm/s. The maximum value for suspension velocity for analysis should be set to at least 500mm/s in order to include the bulk of the data. Again, this is not cast in stone, and some experimentation with typical data will show that increasing the maximum value beyond 500mm/s affects the important values very little. Figure 3. 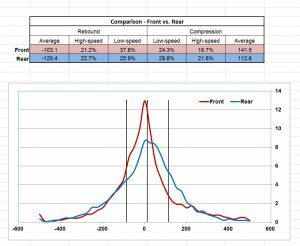 This Excel chart shows sample velocity histograms for the front and rear suspension overlaid for comparison. The table above shows the percentage of time spent in each zone. Figure 3 shows actual data from a Superbike using an Excel spreadsheet to generate the histogram from suspension velocity data. Note that AiM’s suspension analysis works on the suspension position data, and automatically calculates the suspension velocities to generate the histograms. Other software, or if you are using a math package such as Excel, will require you to create the suspension velocity data from position. This can be done using a math channel that outputs the derivative of the suspension position. There are a number of suspension adjustments that can be made to affect the histogram to approach these ideal values. Adding damping in a particular zone will decrease the time in that zone. For example, adding low-speed compression damping will decrease the percentage of time in the low-speed compression zone because suspension action in that zone has been tuned out of the system by adding damping. This decrease in time must be made up in other parts of the histogram, and this is usually seen as more time in the zone opposite in terms of both damping and speed. Using the same example, adding low-speed compression damping to decrease the time in the low-speed compression damping zone will also increase the percentage number in the high-speed rebound damping zone. An easy way to visualize these actions is that adding damping will push the histogram down in that zone, and that push will cause the histogram to bulge in the opposite zone. A stiffer spring will increase time in the low-speed zones (both compression and rebound damping) and decrease time in the high-speed zones. Likewise, a softer spring will decrease time in the low-speed zone and increase time in the high-speed zones. Visualize this as a stiffer spring “pinching” the histogram in from the sides and a softer spring “squashing” the histogram from the top. As the rider goes faster, time in the high-speed zones will increase and time in the low-speed zones will decrease. Note that this response indicates that the rider needs a stiffer spring as he or she goes faster. In practice, such as shown in the sample data used in figure 3, the ideal histogram shape and distribution values may not give the ideal suspension setup, as there are many factors to consider. 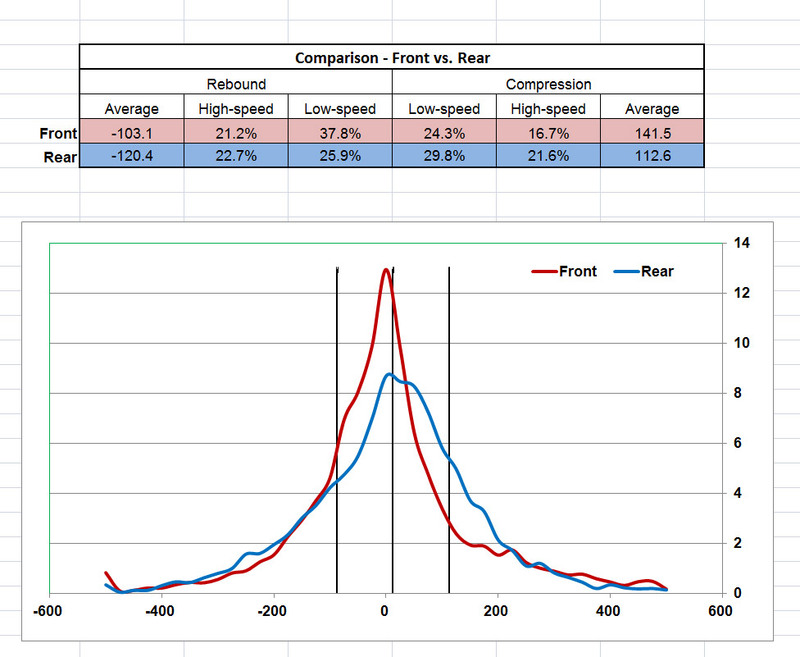 There may be some differences between the front and rear suspension, or discrepancies in the values of each histogram. For example, a hard-braking rider may require more than usual front compression damping, which would affect the shape and numbers of the front histogram. This is the case in figure 3, with the front suspension showing distinctly more high-speed and low-speed compression damping (lower percentage values) to cope with hard braking. While the “ideal” histogram shape does not necessarily translate to the perfect setup in practice, the histograms do provide useful information and can provide input for suspension adjustments, especially when combined with feedback from the rider.